Tacos and Music and Ice Cream, Oh My! Pretty much all of my favorite things wrapped into one kickass wedding! 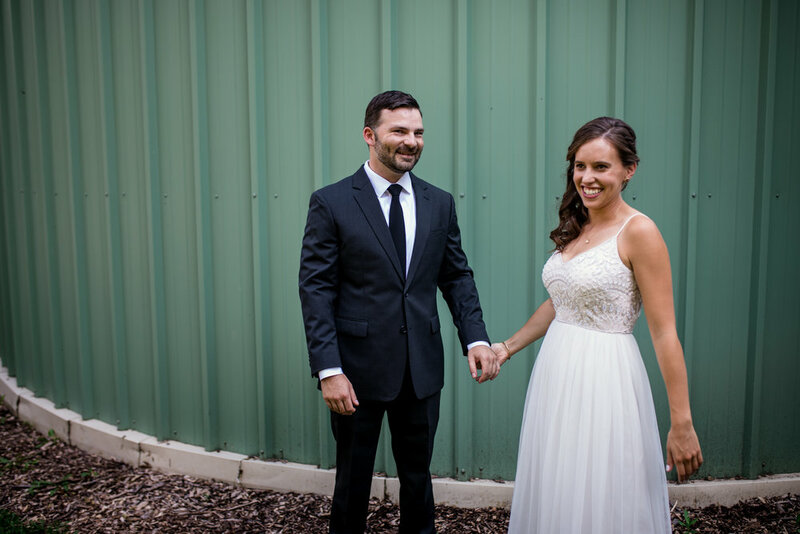 Becca + Kramer planned the perfect day together, celebrating with friends and family at the Aldo Leopold Nature Center in Monona, WI. These two met in 2012 while studying Geography at UW-Madison, and began dating in 2013. They're now both PHD students in the Geography program. Guests came from all over the country to celebrate, since Kramer is from the Seattle, WA area, and Becca is originally from Washington, D.C., and they wanted to have their wedding in their adopted hometown of Madison, WI (or about in the middle for folks coming from near the coasts). The day turned out beautifully, the food (and ice cream) was delicious, and Becca + Kramer were so undeniably happy, it was breathtaking! Congratulations to Becca + Kramer! We are so happy to have been able to celebrate with you! Here are the vendors (with links) that helped make the day amazing! They originally met while Lia was dating a good friend of Jeremy's, and started dating sometime later. That good friend actually stood up with them as a groomsmen on their wedding day (yay for ex-couples who are still friends)! They were also originally a long-distance couple, with Lia in Milwaukee and Jeremy in Chicago, so it was only fitting that Jeremy proposed to Lia in their at one of their favorite coffeeshops in Milwaukee, and then proceeded to have a weekend filled with visits to their favorite spots in Milwaukee as well. They also bonded over the TV show Community, so I feel a special kinship with these two! Lia + Jeremy wanted a laid-back BBQ style wedding, with a twist! Lia, whose mom is Chinese, wanted to surprise her mom with an outfit change into a traditional Chinese gown at the reception, and the results were wonderful! Her mom was pleasantly shocked, and Lia looked stunning in both her traditional American dress by Melissa Sweet Bridal Gowns, as well as her traditional Chinese gown! These two were so sweet and fun to work with! We feel blessed to have been able to celebrate with them! Congratulations Lia + Jeremy! Thanks for having us (and for the AMAZING food truck fare from Umami)! Here are the wedding vendors (with links) who helped make Lia + Jeremy's wedding day so special! Imagine planning the wedding of your dreams... Now Imagine planning two at the same time, and managing to make both amazing! This is Part II in Sunaina + Kyle's story about their two fabulous weddings and how they wove their love for their friends and family into every aspect of their wedding weekend extravaganza! First, MAJOR props to Sunaina + Kyle and all of their helpers. We know just how much time and care goes into wedding planning, and someone who planned two weddings ought to have folk songs written about them. Seriously. Get on that internet. Second, we were so touched by the all the thoughtful details that went into this wedding weekend, in addition to the strong family connections that were evident everywhere. Sunaina's father passed away several years ago, and during Friday's Hindu ceremony, a beautiful portrait of him sat in a place of honor next to Sunaina's mother. During Saturday's American ceremony, Sunaina's brother walked her down the aisle, and her mother was her Matron of Honor, while Kyle's brother was his Best Man. Kyle, a bar manager in Madison, hand-crafted and bottled not one, not two, but seven signature cocktails (including a delicious non-alcoholic ginger beer) for Saturday's reception. The fine folks at Underground Food Collective, on behalf of Sunaina + Kyle, artfully blended traditional Indian and American staples in dishes like Paneer Potato Salad and Curried Chicken Salad, and Kuhl Entertainment played a great mix of American and Indian dance tunes that had everyone on the dance floor! Every detail of both wedding days was carefully and lovingly arranged, and it was really magnificent to be a part of. Once last little wedding day story about Sunaina + Kyle that I think perfectly encapsulates their natures. Once Saturday's ceremony was over and it was time to start the Reception, Sunaina + Kyle got on the dance floor for their first dance. They had let Rob and I in on the secret that since they're not particularly serious people and had no real interest in spending 5 minutes dancing awkwardly in front of everyone, they were going to take the awkward factor up a notch by having the DJ cut to the Chicken Dance mid-song and have everyone participate! Well it worked, and I don't think the dance floor was clear the rest of the night! In fact, some of my favorite photos from Saturday were the late night dancing photos, complete with dance floor smoke and lights! And now, without further adieu, enjoy the photos below, celebrating wedding day #2 for these two fantastic human beings! Here is the list of Vendors (with links) that made the magic happen for Ceremony #2! The wedding so nice, they planned it twice! We really have to hand it to Sunaina + Kyle! They planned not just one incredibly moving and detailed wedding day, but TWO, with the Hindu ceremony taking place on a Friday, and the American ceremony taking place on Saturday. While the weddings (both of them!) were joy-filled and fun, the really amazing thing about all of this is Sunaina + Kyle. One of the first things Sunaina told me was their proposal story. Sunaina is a PHD candidate with a focus in Consumer Marketing, and as a part of her research, spent a ton of time researching creative marriage proposals, so when Kyle decided to ask her to marry him, he knew that the proposal had to be pretty spectacular (no pressure, right Kyle?) Well Kyle had planned to propose during an overseas vacation, but the engagement ring was delayed and arrived at Kyle's parent's house exactly 3 hours after their flight had left ! Unfazed, Kyle had his brother (and best man) send the package to Europe, where, naturally, it did not arrive in time for a proposal, and was ultimately returned to him when they were back in the states, after a 3 week runaround in various shipping facilities. So here he is with the engagement ring, waiting to ask, and just looking for the perfect time. Flash forward a bit, and Sunaina cuts her hand really badly, requiring an emergency room trip and some stitches, and as doctors were stitching up one of her hands, he got down on one knee and proposed, slipping the ring on her uninjured left hand. Needless to say it was incredibly memorable, and spoiler alert; She said yes! The doctor even mentioned that it was the first time he'd had the occasion to wish someone a happy engagement and marriage on their discharge paperwork. With an engagement story that unique, you know the wedding (or weddings) is going to be amazing! Check out the gorgeous photos below from Friday's Hindu ceremony, and come back Thursday to check out the pictures (and more stories) from their American ceremony on Saturday! Here is the list of Vendors (with links) that made it all happen for Ceremony #1! The venue that Cassie + Greg picked out, Tumbledown Barn in Verona, was perfect for their laid back summer wedding, complete with strawberry rhubarb pies for dessert, and more kilts in sight than pants. All of the details came together in a way that was so fitting for these two! Enjoy the photos, and the throwback to summer!